Abdinasir Abdulahi is the law firm’s principal attorney. Mr. Abdulahi earned his Juris Doctorate from William Mitchell College of Law in St. Paul, Minnesota, and also holds a Master of Laws from the University of Minnesota School of Law, and a law degree from Addis Ababa, Ethiopia. While practicing in Africa, Mr. Abdulahi served as a Chief Justice of the Somali Region in Ethiopia’s Supreme Court. Mr. Abdulahi is committed to public service and has worked with Southern Minnesota Regional Legal Services to deliver legal assistance to low-income families. Mr. Abdulahi is a recent National Black Lawyers – Top 100 nominee, and he is extremely active in the legal community as both a speaker and mentor. 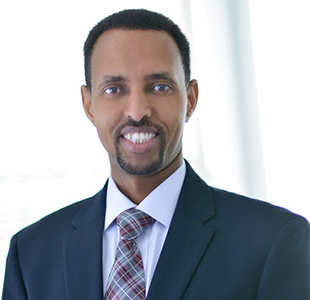 In addition to practicing law in Minnesota, Mr. Abdulahi has represented clients elsewhere in the United States and around the world in a broad range of immigration and international law issues. He is fluent in English, Somali and Amharic and will be heading up the expansion of the firm’s new office locations opening in Mogadishu, Somalia, and Addis Ababa, Ethiopia. Mr. Abdulahi has years of experience practicing before Minnesota State Courts and United States Federal Courts, and is a skilled legal practitioner in personal injury law, family law, criminal defense, immigration and international law.